Denford Limited are Proud Founders and Sponsors of a number of innovative and unique educational projects. These include Land Rover 4×4 in Schools, the Jaguar Primary School Challenge and – most importantly – the F1 in Schools STEM Challenge, which is the world’s most exciting STEM-based (Science, Technology, Engineering & Maths) project. 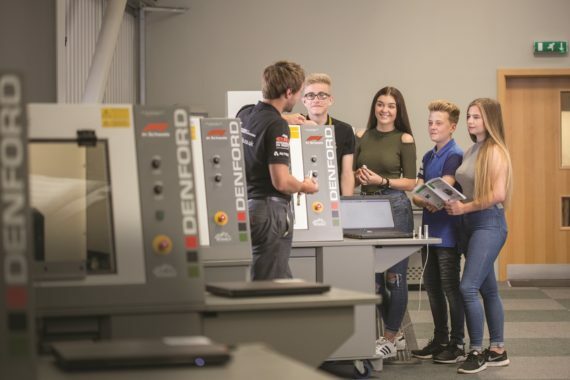 These initiatives are aimed at stimulating students’ interest in, and understanding of design and manufacture, and clearly demonstrate Denford’s dedication and financial commitment to encouraging and promoting student selection and enjoyment of STEM based subjects. Engineering in Motion (EIM) is a not-for-profit organisation totally committed to providing exciting yet challenging educational experiences through the magnetic appeal of Formula One, motorsport and automotive engineering. Engineering in Motion runs innovative educational STEM (Science, Technology, Engineering and Maths) projects with an aim to engage and encourage students to continue studying STEM subjects at apprentice, further and higher education. These projects include the F1 in Schools STEM Challenge, the Jaguar Primary School Challenge and Land Rover 4×4 in Schools. These are exciting International competitions, which currently engage with 5 – 19 years old from primary and secondary school pupils and teachers in over 40 countries around the world. Find out more about the Challenges below. F1 in Schools is a multi-disciplinary challenge in which teams of students aged 9 to 19 deploy CAD/CAM software to collaborate, design, analyse, manufacture, test, and then race miniature gas powered F1 model block cars. F1 in Schools is the world’s most exciting STEM-based (Science, Technology, Engineering and Maths) educational project. Students taking part in the challenge are inspired to learn about physics, aerodynamics, design, manufacture, branding, graphics, sponsorship, marketing, leadership/teamwork, media skills and financial strategy, and apply them in a practical, imaginative, competitive and exciting way. The challenge is supported with the F1 in Schools Curriculum Resource, a set of cross-curricular materials to help you run a project based on the F1 in Schools competition. Designed for pupils aged between 9 and 19, it includes over 60 fully-resourced session plans – everything you need for running the project in your school. With F1 in Schools now operating globally in over 40 countries and currently with over 20 million students aware of the challenge, F1 in Schools provides a real opportunity for a learning experience of a lifetime and the chance to become a World Champion! Land Rover 4×4 in Schools is an international educational programme that raises awareness of STEM (Science, Technology, Engineering and Maths) among students and school children in every region of the UK and across the world. Spanning age ranges of 11 to 19, the challenge involves 3 to 6 team members working together to design and build a 1-1/8 scale radio controlled 4-wheel-drive (4×4) vehicle to set specifications that can successfully negotiate a specifically designed test track that will emulate that of real life and what a full scale 4×4 vehicle can do. Teams entering the challenge will spend a number of week’s designing, researching, building and project managing their 4×4 vehicle to enter it into a regional heat to compete against other schools from their area. Regional winners will be selected through a judging process to go through to the national final where they will compete again, this time against the other regional winners with the aim to become the Land Rover 4×4 in Schools Technology Challenge National Champions. The Jaguar Primary School Challenge engages with primary schools students and teachers across the UK. The challenge is open to students aged 5-11 years old and involves designing and manufacturing the fastest car possible, emulating the design and engineering processes employed by real engineering companies, such as Jaguar Cars. Students are challenged to form a team of 4 pupils and design a race car out of 160g/m² card, complete with wheels, body and even a mini driver. They will design and manufacture a body shell to fit a standard chassis using template software before printing/cutting their designs on to card and then making their car ready to race. The Jaguar Primary School Challenge is sponsored and supported by Jaguar Cars, who have been a supporter of F1 in Schools since its launch in 2000. Jaguar understands the need to encourage and motivate young people to develop key skills needed for companies such as Jaguar to be successful in producing award-winning vehicles. At Denford our belief is that a ‘hands-on’ approach to cross-curricular activities lies at the heart of Design & Technology and Engineering. Our Curriculum Resources provide useful information for teachers to encourage students to develop an informed view about careers in engineering, manufacturing, science and technology in a fun and positive way. Click here for our teacher support materials, or alternatively, click here to visit the F1 in Schools STEM Challenge Learning Channel.